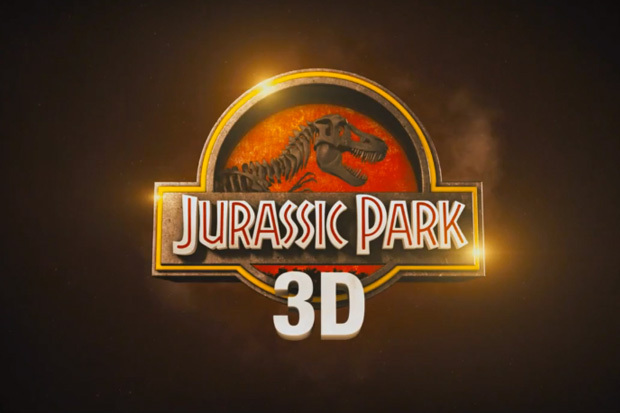 Jurassic Park 3D in Theaters…”Dinosaurs Alive” at Brookfield Zoo! If you grew up a dinosaur fan like me, then you probably remember the release of 1993’s Jurassic Park as being a cinematic game changer! Not only did it feature the most REAL looking dinosaurs ever to stomp the Silver Screen, but also ones that were (at the time) the most scientifically accurate. Gone were the days of two-legged, meat-eaters like Tyrannosaurus Rex standing up straight while dragging its tail behind him as Steven Spielberg proved that CGI effects (when done correctly) were the wave of the future. This past weekend not only saw the re-release of that film (in a new 3D format), but also the opening of an animatronic dinosaur exhibit at Chicago’s Brookfield Zoo! 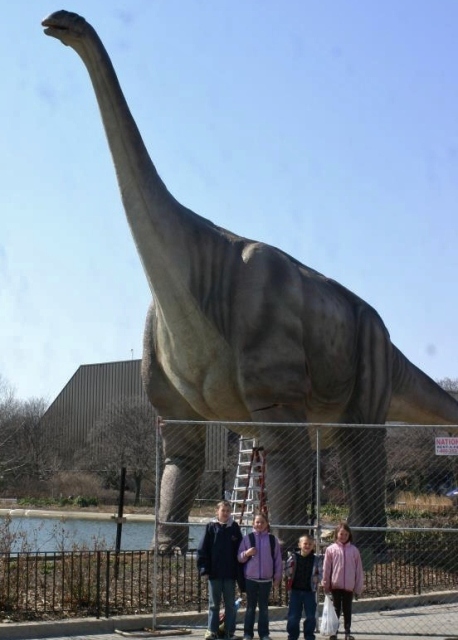 What a wonderful time to be a dino-geek…especially one living near The Windy City! Needless to say, I indulged in BOTH prehistoric events, starting with the zoo’s new exhibit. This past decade has seen many zoos around the country allowing guests to ogle animals of the past while visiting the ones living today. In bringing the ever-popular dinosaurs as a special attraction, this actually helps zoo’s raise needed conservation funds, thereby preventing many species from going the way of these guys. Last year I had the pleasure of visiting two different zoo/dinosaur attractions; The Milwaukee County Zoo (story HERE) and The Franklin Park Zoo (covered HERE) Massachusetts. 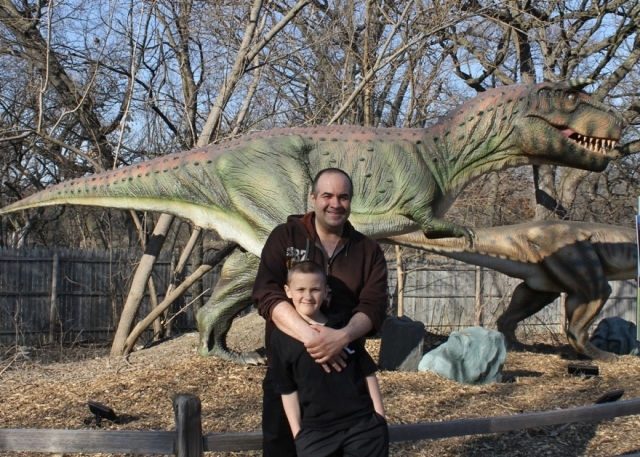 This past Thursday, I grabbed the kids and headed up to Brookfield Zoo for a special sneak preview. While Spring was late to arrive here in Chicago, the weather on this day proved perfect with sunshine and temps in the high ’50s. 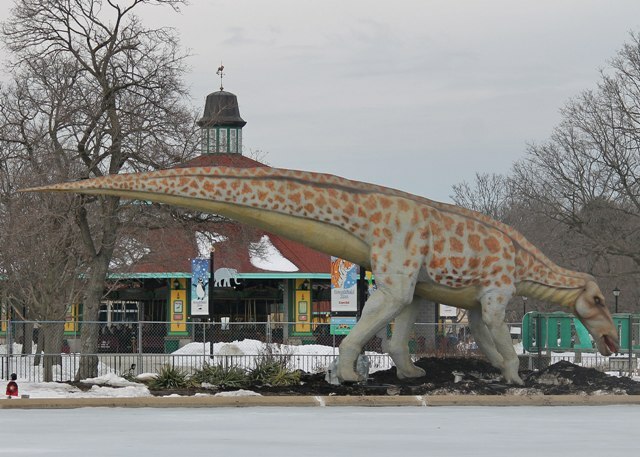 Brookfield Zoo had featured a temporary dinosaur exhibit for the first time back in 2009 and it was a big hit. Prior to that opening, I’ll never forget walking through the zoo’s main gate and seeing a giant Ruyang Yellow River Dinosaur standing by their signature Roosevelt Fountain. I was so moved by the sight, I felt like grabbing my knee caps and catching my breath like Dr. Alan Grant and uttering his famous line, “They do move in herds….” (okay, this one was standing by itself, but that quote seems good for all dino occasions). This year features an ALL-NEW dinosaur standing in the same spot. The Shantungosaurus was one of the largest & longest two-legged dinosaurs discovered and a member of the hadrosaur (duck-billed) family of plant eaters. Like the Yellow River Dinosaur, Shantungosaurus heralds from China which has become a hot-bed of new paleo discoveries! This Dinosaur comes “Alive” at Brookfield Zoo 2013! This is not the first duck-billed dinosaur to grace this zoo, however. His smaller cousin, “Archie” the Anatosaurus (formerly called a Trachodon), has been standing (albeit, standing incorrectly “straight up”) over by the zoo’s Indian Lake since the year I was born (1970). 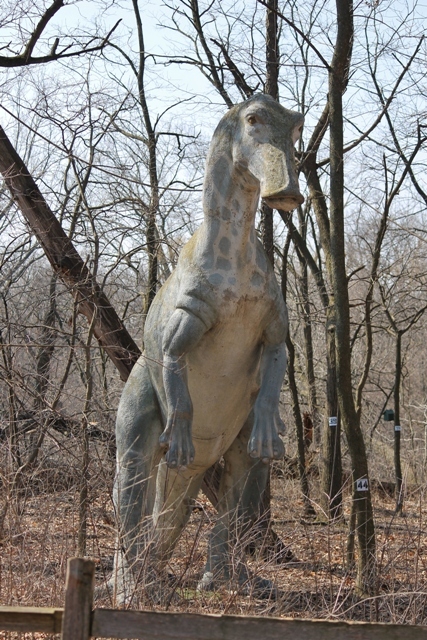 It had been part of a group of fiberglass dinosaurs featured in 1964’s New York World’s Fair before being donated to the zoo. I really enjoyed the last collection of dinosaurs that Brookfield had but, to be honest, this years is even BETTER! Not only does the zoo feature many unusual dinosaurs that will provide new, tongue-twisting names for many to discover, but their overall presentation has improved as well! 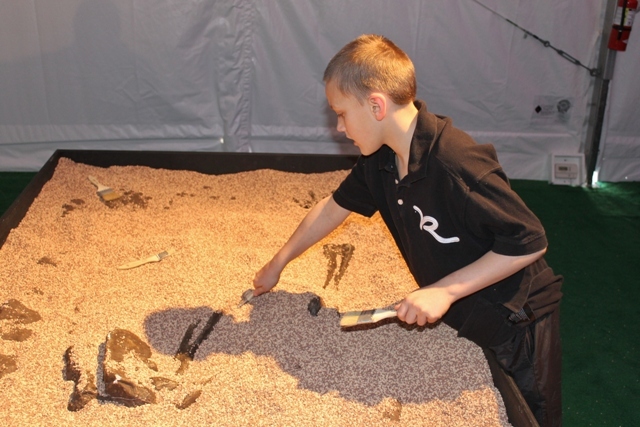 The best addition to this year’s set-up was via “Feathers to Fossils,” a special events tent providing interactive learning experiences the whole family will enjoy! This is a great tie-in to the re-release of Jurassic Park since that was the film that really brought the dinosaur/bird connection into mainstream consciousness. 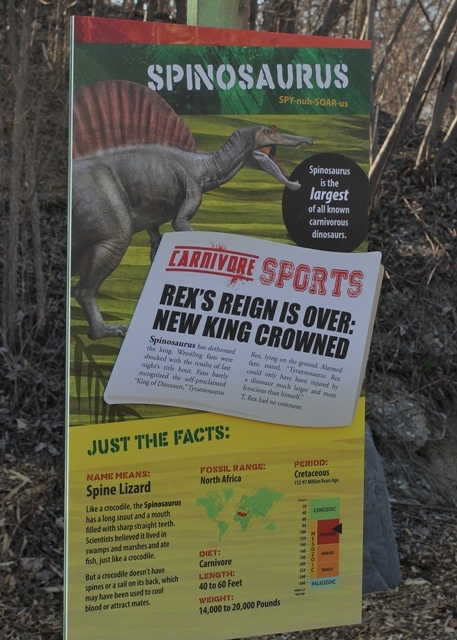 Dinosaurs may be gone, but their decedents are living on… right in our own backyards! “Feathers to Fossils” features even more life-sized and mobile dinosaurs, only these are conceptualized versions with downy feathers highlighting their avian connection. My kids and I were VERY impressed with this portion of the exhibit and thought it alone was worth the price of admission! See the WHOLE animal at Brookfield Zoo THIS summer! Zoo’s new exhibit takes note! Jurassic Park did take some creative liberties (how did Dilophosaurus end up with a fan-face? 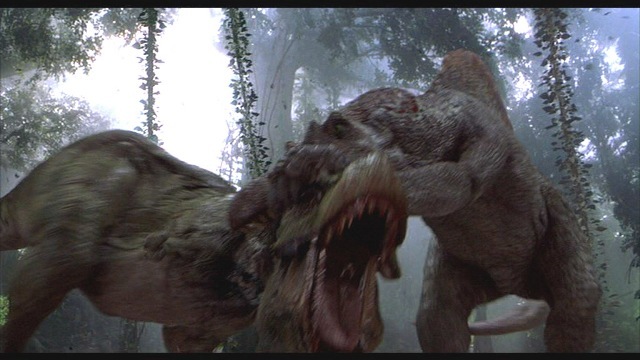 ), with the most controversy revolving around whether T-Rex was a hunter or scavenger. 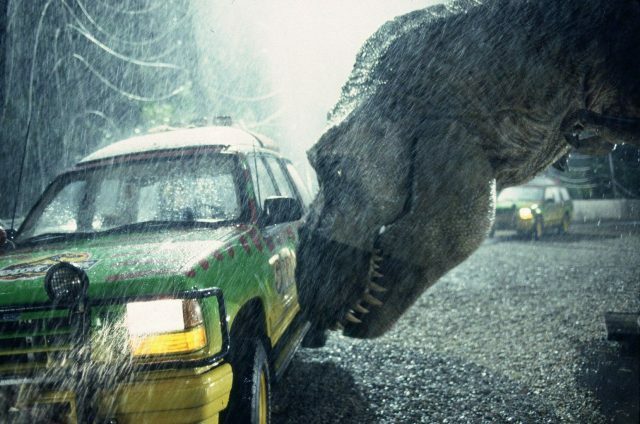 At this date, the consensus is that it was a scavenger which totally overturns Dr. Alan Grant’s claim that “T-Rex doesn’t want to be fed, he wants to hunt!” While that debate still rages, one thing most paleontologists agree on is that, unlike the film, T-Rex’s ability to locate its quarry (living or dead) was not based on movement. 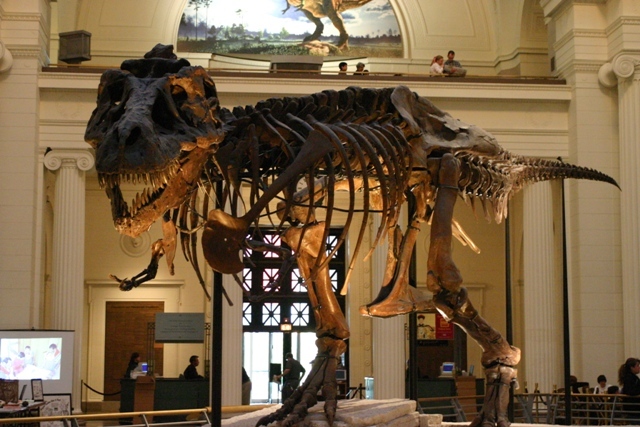 The study of “Sue,” the most extensive T-Rex skeleton ever discovered, revealed a skull that allowed for a tremendous sense of “smell.” Lucky me, “Sue” is also located right here in Chicago at The Field Museum. Whether accurate or not, Jurassic Park is a lot of fun and worth seeing again on the big screen, and especially with an enthusiastic crowd! I was not impressed, however, with the 3D format. While a novelty in the beginning, it quickly wore off and I stopped noticing it even when I tried. Another problem for me; once I see something in Hi-Def blu-ray, it’s difficult to experience the duller picture of a theater. I must be picky since even all-digital screens seem less crisp than what many of us have in our living rooms. My guess is that if you own a 3D TV, it will be even better once its out on home video. Either way, kids today will love having a chance to see their favorite “monsters” on the big screen for the first time! If you live in Chicago, then you can follow up that experience with a visit to Brookfield Zoo (or vice versa) and walk away an expert! Dinosaurs Alive! is $5 for adults and $3 for children and seniors over 65 in addition to general zoo admission. Children 2 and under are free. 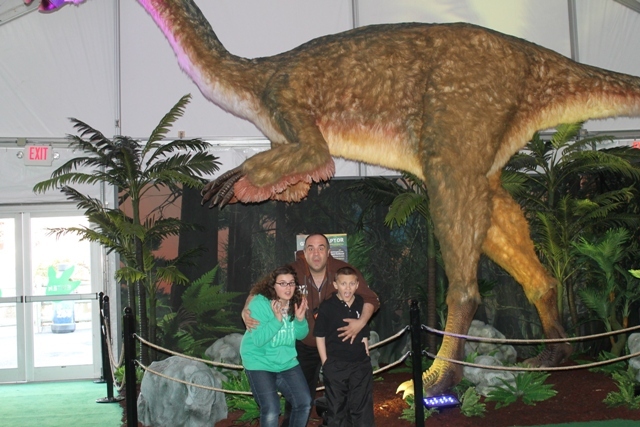 Members can take advantage of half-price admission to Dinosaurs Alive! Members of the zoo get half-admission! 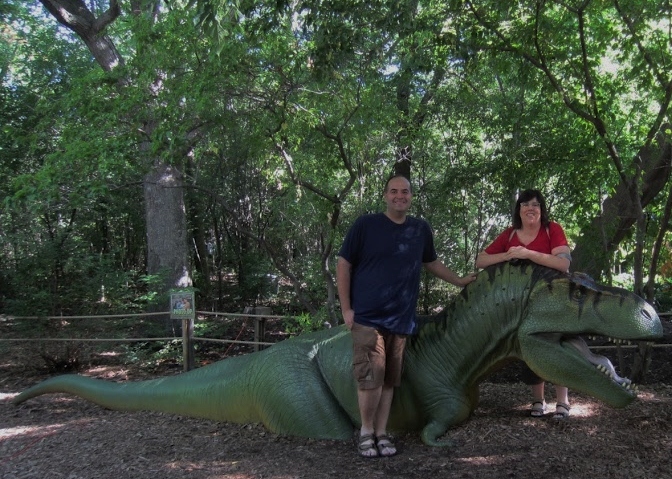 Incidentally, if you’d like too see footage of David’s and my visit to Franklin Park Zoo’s temporary 2012 exhibit, or my visit with Elizabeth Ocon at Milwaukee County Zoo’s Dino exhibit that same year, I recently turned those experiences into clips. Those exhibits have come and gone so I feel okay with sharing…as for Brookfield Zoo you need to come out and see it for yourself! Also, while the same Dino company was used for these two parks, Brookfield uses a totally different one…so repeats of what you see below! My next post will continue on with coverage of Horrorhound Weekend! This entry was posted in Dinosaurs & Prehistoric Attractions! and tagged BROOKFIELD ZOO, DINOSAURS, FOSSILS, Franklin Park Zoo, JURASSIC PARK, MILWAUKEE COUNTY ZOO, Ruyang Yellow River Dinosaur, Shantungosaurus, SPINOSAURUS, T-REX, TYRANNOSAURUS REX. Bookmark the permalink. ← THE EVIL DEAD thrill the Living!